As we prepare to launch this year's Park-A-Day Summer Challenge, 2010 challenger Liza Sullivan reflects on her eye-opening experiences visiting 50 different parks, playgrounds, and public playspaces in the Chicago area with her 3-year-old twins (pictured left). "I was unaware of the surprising number of parks, playgrounds, and nature preserves in or near our community... Most are underused. 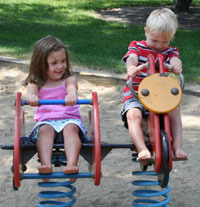 With the exception of some traditional playgrounds, we were either alone or with one or two families. The benefits of these facilities to a child’s development speak greatly to the power of the play movement which I advocate, and which is growing in the U.S."
Read the full story in Winnetka Alliance Newsletter for more reflections, observations, and anecdotes. See Liza's photos and stories from the 2010 Challenge on her kaboom.org profile. Stay tuned for our 2011 Park-A-Day Challenge!